We are looking to work with all local organizations and individuals who support diversity and seek to counter messages of hate with a strong declaration of “Unity in the Community.” If interested in joining this effort, please contact us. 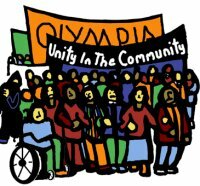 You may email us at info@olympiaunityinthecommunity.net. Please include your full name and local group affiliation or reason for interest in our work. Because some in our community have recently been harassed by hate groups, we require this information: in short, we want to know who you are. You may also become involved through one of our local partners, listed at links. Display your celebration of diversity! Request UITC posters & stickers by emailing us at posters@olympiaunityinthecommunity.net. Problems with something on this website?